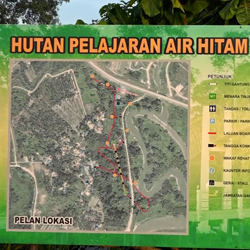 Air Hitam Dalam Recreational Forest is a small freshwater swamp surrounded by paddy field, located approximately 10km from Butterworth which is less than 20 minutes drive. Birdwatching is made possible in this swamp with the elevated concrete walkway. Birders can spend the whole day here but best time is still in the morning and later in the afternoon.